Congratulations to Ashley, Kim, Patricia and James on their new jobs! Throughout May and June they have been starting their new jobs at Jax Kitchen, Kilwins, Baptist Medical Center and Community Outreach. We are proud that these local businesses have recognized the dedication and hardworking nature of individuals with disabilities and are providing community-based employment opportunities. 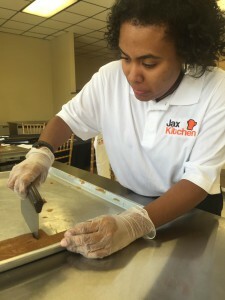 Ashley joined Jax Kitchen as a food packaging associate for Kilwins in May. She is responsible for cutting, weighing and wrapping caramel chews, folding boxes, packing different candies, putting labels and ingredients stickers on items and preparing them to be displayed and sold at Kilwins. Her Supervisor, David, is excited to watch Ashley increase her skills and expand her responsibilities as she becomes more comfortable in her position. 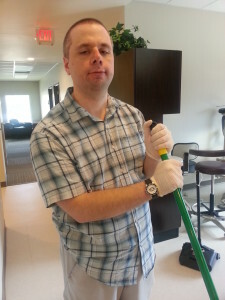 James has been working at Community Health Outreach as a janitor since May. He is responsible for cleaning the new dental/medical building that was built as part of the Apple Project two days a week. 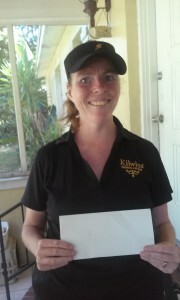 Kim joined the Kilwins team in the beginning of June as a retail associate. 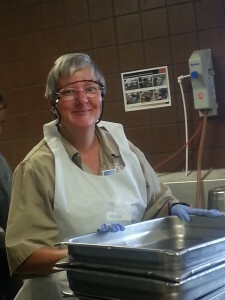 Kim’s main responsibility is to provide candy samples to customers. Her big smile and outgoing nature draws customers in.